The new Israeli Left — Zionist and liberal — reinvented itself immediately following the 1967 war.1 During the 1948 war and its aftermath, the Zionist Left had difficulty in working out the contradiction between its socialist obligations to social and political justice and being an inseparable part of the Zionist national occupation of Palestinian lands, upon which the new state of Israel was established. The occupation of the West Bank and Gaza Strip in 1967 provided, first and foremost, a partial solution to this schizophrenia. With the opening of new expanses over the Green Line, the Zionist Left gained some breathing room and could now elegantly separate the “here” from the “there,” to create for itself an identity and new agenda which separated the “external” (outside the 1967 borders) from the “internal” (within the 1967 borders). The first deals with Palestinians in the occupied territories in the West Bank and Gaza Strip. The second deals with the different groups within the jurisdiction of the state of Israel, mainly with Mizrahi Jews and Palestinian citizens of Israel. “There,” the definitions are based on nationality; “here,” they are based on social class (including Israeli Palestinians). Thus, the Left created and instituted two political discourses, which supposedly do not meet. The fact that the two establish themselves as separate discourses prevents us from seeing how they create each other and how the distinction between them actually erases three important facts. First, that the bifurcation between there (the occupied territories in the West Bank and Gaza Strip) and here (normal society) is artificial and false. Second, and not without any connection to the previous fact, that the occupation regime does not stop at the checkpoint nor at the Green Line. It is woven into the internal fabric of society in Israel, at all levels, and is created within it. Third, that the Israeli occupation regime is directed not only outward but also inward, into the society in Israel. Israel has never recognized clear-cut external boundaries. It has never reconciled itself to ceasefire borders. The border served as a one-way valve. It was meant to seal movement from “there” to “here,” but all the while allowing free movement from “here” to “there.” In other words, it was meant to hermetically stop the movement of “infiltrators” in the 1950s, those that came to visit their assets, which were confiscated by the absentee landlord law (any property owner who left Israel between 29 November 1947 and 1 September 1948 and went to an enemy country). But a sealed border does not prevent Israelis from crossing the border.2 After all, how could we conduct retaliation operations and revenge? How could we hike to exotic and desirable places like the ancient city of Petra in Jordan? It is customary here to say that the long arm of the security forces would catch up with them anywhere. These border crossings were always the object of desire for “the best of our boys,” many of whom were sons of the cooperative settlement movement (the moshavim and kibbutzim), the cradle of the Zionist Left. The border not only served as a one-way valve or thin line. It became a site, a space of its own. It is enough to take notice of the cultural terms used to define this space: “no man’s land,” “the frontier,” “the border zone.”3 After it became clear to the Left that the occupation did not pay off for the Jews (corruption of the youth, the demographic phantom) the Green Line became a symbolic Maginot Line (“with some changes in the border”). The Green Line became a fetish. The fetishism of the Green Line has a dialectical dynamics. It purifies the occupation, reorganizes and elevates it to channels that deny the intensity and injustices of the Israeli occupation machinery. This fetishism allows the artificial separation between the “good guys” and the “bad guys”; it creates a moral indifference and hides the fact that the Israeli colonial occupation is found everywhere, not only over the Green Line. I will give two examples for the political and ethical mistakes which this approach creates. The first one exemplifies how the ethical indifference of Israeli sociologists reproduces the fetish of the Green Line. The second one exemplifies how the symbolism of the Green Line effaces the fact that the occupation regime is turned inward, to within Israeli society as a whole. In the summer of 2004, Michael Burawoy, then President of the American Sociological Association, asked to me to deliver a lecture about public sociology in Israel and Palestine at the annual conference of the association in San Francisco. Burawoy is a radical sociologist from Berkeley, an exceptional personality in American sociology. Burawoy invited 25 critical sociologists from all over the world, with the overt purpose to “return American sociology to its natural greatness, provincialize it,” and thus recognize its particularity. With pleasure, I agreed to his request. For years it has bothered me that Israeli sociology has clearly been a subcontractor of American apolitical research paradigms, and that there is very little similarity between these paradigms and the context we live in.4 The uncritical import of American research paradigms for understanding Israeli society is an institutionalized phenomenon with problems that should be seriously assessed. Because academic promotion of Israeli sociologists is dependent on publication in international journals, most research is written in English for American sociologists. Very often, the price they pay for seeking “universality” is either researching societies other than one’s own or downplaying the specificities of local politics when they do research on Israel. In preparing my lecture at the conference, I checked how sociologists in Israel react to so central an issue as the occupation and its injustices. You will not be surprised that, like many social scientists, Israeli sociologists rarely research the occupation, and refrain from taking a position on ethical questions with the disclaimer of academic neutrality. That’s how sociology established itself from the beginning. The German sociologist Max Weber once wrote that one has to distinguish between science and politics. Weber really meant to defend science from politics, but perhaps he also wanted to defend ethics and politics from the technocracy of scientists. I wonder if following upon Weber it is possible to ask to defend ethics from the violent neutrality of social scientists. For our purpose, I want to show that the fetishism of the Green Line is central in the formation of a neutral and apolitical consciousness of social scientists in Israel. In 2004, within the five largest universities in Israel, there were some 133 sociologists; two of them are Palestinians, 14 are Mizrahi Jews. All the rest, 117 sociologists, are Ashkenazi Jews (only 34 of them are women). Between 2002 and 2004, among the 133 sociologists, how many took a moral stand against the occupation? Eight only, which is about six percent of the sociologists (the same ratio is found among historians; and nine percent among philosophers). How many of them belong to protest movements? Six only, that is four percent of the sociologists. How many signed two different petitions in those two years? Seven persons only; about five percent of the sociologists. But what is more worrisome is the fact that in the current political reality, the occupation has never become a real paradigm in the Israeli academe. Only one sociologist, Yuval Yonay, teaches a course on the occupation; only six sociologists research the occupation in any direct manner. In the early 1990s Baruch Kimmerling (and here one can add Oren Yiftachel) broadened the category of “Israeli society” to include the territories beyond the Green Line, but without much success.5 In most sociological scholarship, Israeli society is imagined as within the Green Line (Israel’s pre-1967 borders). They see the occupation as a temporary phenomenon, like an accident in the political history of Israel, and not an integral part of the social and political fabric of Israel. Why? Are the territories, which have been occupied for most of Israel’s history, really another planet? Is what is happening there separate from what is happening here? The answer is No with a capital N . This liberal blindness is anchored in a fetishism of the Green Line by the Israeli Left. The distinction between good guys, the liberal Left within the Green Line, and the bad guys, paramilitary groups in the settlements over there, is artificial. True, many of the settlers are land robbers. But let not the Left use this in order to massage their conscience as was done following Rabin’s assassination.6 Yossi Sarid, the former left-wing Meretz Party leader, for example, formulated the connection between Hebron and Jerusalem as one between two different countries: The State of Judea and the State of Israel.7 Are they really two countries? If that were the case, who is providing the settlers with the economic and physical infrastructure? Who is providing them with the infrastructures for water, sewerage, electricity, and telephone lines? Who is providing them with health services and education? What is the role of organizations such as the Histadrut (Israel’s General Federation of Labor), the Jewish National Fund, the Jewish Agency, and the United Jewish Appeal as secondary contractors administering the occupation? How many thousands of dunam did the Board of Trustees of the Jewish National Fund acquire in areas “of strategic value” in the West Bank?8 How is it that we have an independent Council for Higher Education for institutions of higher learning in the occupied territories? Who teaches the soldiers of the occupation, or the settlers and their children, in universities in Israel? Who supplies the legal infrastructure for the destruction of tens of thousands of Palestinian homes since 1967? Who builds and paves the roads that crosscut the West Bank? Who drives on the new bypass “apartheid” road 443 from Tel Aviv to Jerusalem, and back? Who speaks about the settlers as “our brothers”? And I haven’t mentioned the soldiers, who come from good homes in Tel-Aviv, or the security inspectors who implement racist practices of the country at the airport, the demographers who make a career out of counting the heads of Arabs, or the correspondents of the occupation, the majority of whom claim to be liberals. The settlements are not a spontaneous and random project of a few eccentric people. There is here state planning into which Messianism has been inserted, and not the contrary. In 1945, Hannah Arendt wrote, “A good German is a dead German” — an expression common in Germany during the war. In racist Israel the expression has been pegged onto the Arabs, but its meaning distorted. Hannah Arendt wanted to explain that in Nazi Germany the distinction between good and bad people was not possible, just as Adenauer’s “zero hour” was problematic. Arendt asked how it is possible that millions of Germans became overnight “normal” because of a political decision. How is it that millions of Germans were cleansed of guilt in the eyes of Israelis and only the Palestinian Mufti remained a Nazi in the historiographic consciousness? In the Germany of 1945, an expression circulated that only a German found hung on a tree was a good German precisely because the Nazis had hung him. And what about the rest of the Germans? It is not clear. Here, in Israel, thank God, they have yet to hang any opponent of the regime, but there is no need. The occupation is an integral part of the society in Israel, not a foreign implant. It is enough to observe how the government planners of the disengagement from the Gaza Strip threatened the settlers that the country and the corporations “will turn off the faucets” — that is, the health clinics, the bank branches, the gasoline companies, electricity, and schools.9 Israeli society is both the source and outcome of the occupation. Not many in Israel noticed that the settlers from Gush Katif (a bloc of 16 Israeli settlements which was situated in the southern Gaza Strip), who struggled against the evacuation, received, not unexpectedly, reinforcement from the “salt of the earth,” the veteran workers’ settlement movement. At Moshav Nahalal in the Galilee, about 400 people (once erstwhile settlers) from this movement announced the establishment of a headquarters to struggle against the evacuation. One of the organizers of this initiative, hailing from Moshav Moledet, said: “Gush Katif arose from the cooperative settlement movement of the moshavim and kibbutzim. It founded the Labor Party. We know what it means to establish a settlement and hold onto the Land of Israel.” The coordinator of Kibbutz Hamadia added: “We want to signal to the government that it is still possible to believe in old-fashioned values.”10 But for the present moment, as historian Idit Zertal and journalist Akiva Eldar show in their book The Masters of the Land: the Settlers and the State of Israel 1967–2004, the settlers in the occupied territories are doing the dirty work directly. And the filth which the settlers are carrying out under state patronage is anchored deeply in the political theology of the workers’ movement. It is possible to distinguish between two types of border regimes. One is the neoliberal border regime which is based on lowering economic borders (easing the entry of capital and cheap labor) while raising the political borders (making more difficult granting rights). Migrant workers are a classic example. Only rarely will they obtain political rights. These borders find expression in administering not only Israeli citizenship, but also additional spheres, like the Jewish body and racial purity. Last year it came to our notice that Chinese migrant workers had signed a contract which forbids them from having sexual relations with Jewish women. The second border regime is based on blurring the external political borders while raising the internal borders — be they national, economic, status, or ethnic. This border regime can be called a global colonial one. Israel answers to both models of border regimes. Why does this occur? The reason is simple: the distinction between “external” and “internal” in Israel is artificial.11 Rejection of internal borders would almost collapse the Israeli regime. The internal borders are means to stop the collapse of Zionism within the space within which it lives. The more the external boundaries dissolve and become blurred (“The Separation Fence,” “The West Bank Barrier” or “The Wall,” “The Philadelphia Route” on the border between Gaza and Egypt, “disengagement,” “withdrawal,” and “reinforcement”), the internal boundaries between social classes and ethnic groups harden. We deduced this when we examined the feudal regime of privileges that administers Israeli territory. Within the Green Line, not one new Palestinian settlement has been built since 1948; many communities remain legally unrecognized. Between 1995 and 2001, only 0.25 percent of state lands were transferred for Arab use. The amount of land under Arab ownership ranges between 2.5 and 3.5 percent of all the land in the country.12 Palestinian citizens of Israel have no access to land, to the Civil Administration’s Planning Department, Israel Lands Authority (the holding company for most of the land in the country), or para-state Zionist organizations that administer lands on a racist basis, such as the Jewish National Fund and the Jewish Agency. The distribution of land in the Galilee shows the ethnic distortion within Jewish society as well as between Jews and Arabs. Sixty-three percent of the land in the Galilee is under the jurisdiction of regional councils, the majority being Ashkenazi Jews (of European origins), who make up six percent of the population. In contrast, 21 percent of the land is under the jurisdiction of local municipalities, the majority being the Mizrahi Jews (originally hailing from the Muslim world). Land under the jurisdiction of local Arab municipalities comes to only 16 percent, while the Arab population makes up 72 percent of the total population of the Galilee. Recently, we are witnessing a significant increase in “border disputes” within the country.13 There are not only political conflicts on land resources; they denote the glaring distortion upon which the Zionist ideology is based — expansion by appointing its typical representatives (regional councils) in order to hold on to assets, and prevention of the expansion of “others,” mostly Palestinians but also Mizrahi Jews. The distorted spatial distribution finds expression in the allocation of lands between the regional councils and the local authorities, in accordance with their taxation potential. While more than 70 percent of the country’s population lives in urban areas, the regional councils — the Jewish Ashkenazi feudal aristocracy of the Israeli republic — control about 80 percent of the country’s land, not only agricultural areas but also industrial areas housing many industries with high taxation potential.14 The regional councils maintain an almost total control over land reserves in Israel and the territories with the highest tax potential. The Tamar Regional Council, for example, has an inhabitant/land reserves ratio of 1:1000 in comparison with the development town of Dimona. It is a good idea to read once more this data. For every kilometer of land for a resident of Dimona, the resident of the Tamar Regional Council has 1000 kilometers. Moreover, all that yields money is within the jurisdiction of the Tamar Regional Council: the nuclear reactor near Dimona, the Dead Sea Works, the hotels along the Dead Sea shore, gasoline stations. It would be enough if some of these were transferred to Dimona in order that the development town would no longer be dependent on the state. Such is the situation in many development towns and Palestinian settlements. This spatial control, which is constituted by political, economic, and cultural control, amazingly agrees with the internal grammar of the Zionist border regime. This is also called internal colonialism, that is to say, control over space through ethnic and racist segregation. The main purpose of the Wall which Israel is building in the West Bank is not to protect Israeli civilians from terrorist attacks. The Wall is clearly political, and the international community easily recognized this. It is a wall whose purpose is to annex occupied lands. It is a wall that creates expulsion (population “transfer”) of Palestinians trapped between the Green Line and the route of the barrier. It is a barrier which upsets any possibility of creating territorial continuity for areas under Palestinian sovereignty. The Wall is not a border between two countries. It moves on its own and marks itself. We find similar walls within the Green Line, in Lod, Ramle and Jas’r el-Zarka. They allow physical segregation between Jews and Arabs in mixed cities. But most of all, the Wall expresses the internal colonialism in Israel. It is customary for us to distinguish between state and society and even to formulate a connection between them in different ways. Members of the leftist Meretz Party and the Peace Now Movement once proposed a superficial and limiting formulation: “Money for the Neighborhoods, Not for the Settlements.” This slogan is a false one: the monetary and fiscal policy in Israel is not related to the occupation, but is generated by the American neoliberal ideology, which exists independently. Dani Gutwein proposed another formulation, according to which the welfare state of Israel (if it ever existed) was moved from within the Green Line to the territories, for Jews only.15 There, the settlers receive all that is ascribed to the classic welfare state: full employment, subsidized housing, health, and subsidized education. The movement of (non-ideological) settlers to the territories stems from the inequality within the Green Line. The end of the occupation goes by the reduction of inequality among Jews within the Green Line. These two formulations (Peace Now’s version and Gutwein’s) are based on instituting the separation between state and society. What I am trying to say is that state and society are one and the same. What is customary to see as social, for example, changes in internal borders, is also political, because these are based on the same principles. In his well-known Discourse upon the Origin and the Foundation of the Inequality among Mankind, Rousseau wrote on the issue of boundaries. “The first man who, having fenced off a plot of land, thought of saying, ‘This is mine’ and found people simple enough to believe him was the real founder [ . . . ] [of inequality]. How many crimes, wars, murders, how many miseries and horrors might the human race have been spared by the one who [ . . . ] [had indicated this lie about fencing the fence].” Rousseau set out to secularize inequality, just as Marx did afterwards. They removed inequality from theology and metaphysics and situated it in society itself. This is also the case for changes in borders. If the existing municipal boundaries were eliminated and redefined, not according to the Zionist principles of occupation, then a large share of the inequality in Israel would disappear. But this is not going to happen so fast, because until then it will be explained away in a metaphysical manner. They will say that the poor don’t work; that they are poor because they have large families; they will grind out innumerable, unfounded economic truths, such as “a rise in the minimum wage produces unemployment”; and they will also quote the ultimate metaphysical argument “We admit that there were prejudices in the 1950s, but what do you want today? Why are the Mizrahi Jews unable to extricate themselves?” The prejudices were not only in the 1950s; they exist here and now, and the border regime is one central example. This regime reproduces the ethnic-national distortion here and there. It’s the same regime — an occupation regime directed inward against society in Israel. The struggle against the occupation must be total. It must be an anti-colonial struggle that will connect between external colonialism and internal colonialism. It cannot separate issues of inequality from issues of political justice, or the opposite. It means boycotting companies that produce goods for perpetuating the occupation, such as those companies which produce goods while oppressing their workers in Israel or outside of it. It is a struggle which understands the occupation in its totality. Not a separation between here and there, not a separation between state and society, not a separation between politics and culture, but an outlook which sees the occupation as an inseparable part of the imperial history in the Middle East. 1 In this context, see Shenhav, Yehouda, 2001, “The Red Line of the Green Line,” in Ofir, Adir (ed), Real-Time, Tel Aviv, pp. 205-210 (Hebrew). 2 See the excellent study of Kemp, Adriana, 1997, Talking Boundaries: The Making of Political Territory in Israel 1949-1957, Ph.D. Thesis (Hebrew), Tel Aiv University. 3 See Eyal, Gil, 2006, The Disenchantment of the Orient: Expertise in Arab Affairs and the Israeli State, Stanford University Press, Stanford. 4 See Shenhav, Yehouda, 2000, “Does There Exist an Israeli Sociology,” Israeli Sociology, Vol. 4, 675-680 (Hebrew). 5 Baruch Kimmerling, 1992, “Sociology, Ideology, and Nation Building: The Palestinians and their Meaning in Israeli Sociology,” American Sociological Review, Vol. 57, 446-460. 6 In this context see Ariella Azoulay who challenges the ideological setup which imposes a choice between “the incitement thesis” of the political left and “the weeds thesis” of the political right. To Azoulay, this division disconnects the assassination of Rabin from the mechanisms producing violence in Israel society, common to left- and right-wing people, the religious and secular, Mizrahi and Ashkenazi Jews, men and women. These mechanisms do not break down the public into good guys and bad guys; they are not polarized between top-down supervision (one system) and an alert democracy (the other system). Azoulay, Ariella, 2000, “The Ghost of Yigal Amir,” Theory and Criticism, Vol. 17, 9-26 (Hebrew). 7 Sarid, Yossi, “Excuse Me, The Pain Is Over,” Ha’aretz (Part 2) (Hebrew), 24 January 2005. For criticism, see Zertal, Idit, Eldar, Akiva, 2005, The Masters of the Land (Hebrew). 8 For example Barakat, Amiram, “Despite its Declarations, the Jewish National Fund Acquired Tens of Thousands of Dunams of Land in the Territories,” Ha’aretz (Hebrew), 14 February 2005, p. 5A. 9 Report from the adviser to the Primer Minister on closing the valves. See Harel, Amos, “On July 20 Electricity and Water Will Be Cut Off,” Ha’aretz (Hebrew), 22 February 2005, p. 4A. 10 Hassun, Nir, “Moshav and Kibbutz Members Established Headquarters against the Disengagement,” Ha’aretz (Hebrew), 15 February 2005, p. 4A. 11 Lev Grinberg has written on the relationship between the inside and outside with reference to the concept of democracy. He is of the opinion that there is a connection between the absence of democracy in military rule over Palestinians in the occupied territories and the limitations of democracy within Israeli society proper. He also used the concepts “imagined democracy” and “imagined borders.” See his “Imagined Democracy in Israel,” Israeli Sociology (Hebrew), Vol. 2/1, 209-240. 12 For detailed statistics, see Yiftachel, Oren and Kedar, Sandy, 2003, “On Power and Land: The Israeli Land Regime,” in Shenhav, Yehouda (ed), Space, Land, Home: The Origin of the Israeli Territorial Regime, Tel-Aviv (Hebrew), pp. 18-52. 13 Hakeshet Hademocratit (Mizrahi Democratic Rainbow), Nov. 2000, “Land and Social Justice: The Entrenchment of the Agricultural Rights in the Land Compared to the Rights of Public Housing Tenants,” Position Paper. 14 These statistics are based on Ravit Hananel‘s research. She also prepared for the Hakeshet Hademocratit the working paper on “The Mizrahi Democratic Rainbow for Reforms in Amending Municipal Borders,” Tel Aviv, Nov. 2004. 15 Gutwein, Dani, 2004, “Notes on the Class Foundations of the Occupation,” Theory and Criticism, Vol. 24, 203-214 (Hebrew). 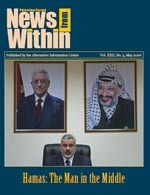 See News from Within, Vol. XXII, No. 4, April 2006.